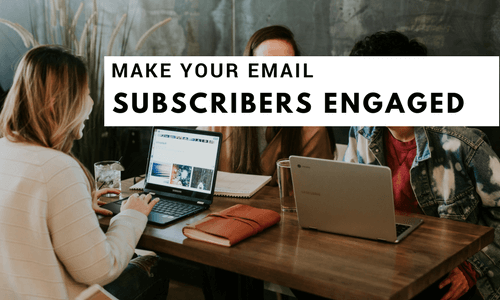 Got new email subscribers? The challenging part is keeping them entertained and engaged. Having an effective email marketing strategy is the key to being successful. Take a moment to consider your inbox, do you have too many messages coming in that you sometimes feel overwhelmed? That’s more than likely the same thing going on with every user you are sending an email communication to. The good news is that you have nothing to worry. We are going to share the secret recipe to keep your email subscribers engaged by giving them what they want. Everyone wants something for free, everyone wants to feel a connection, and people want to feel like they are essential and not just a number. Is there a daily email that you currently get that you pretty much open every day? Think about what compels you to open that email. Personally, one of the emails that I open almost every day is a neighborhood crime watch email. It’s an email from EveryBlock that highlights things are going on within a few miles radius of my zip code. It provides me with information about crime reports, local events, service requests, and what locals are talking about. I wanted to share this experience with you because the email feels very personal. As we mentioned earlier, people want to feel important, and we want to feel connected. We want to feel as if we belong to a part of that community. One of the other takeaways from this daily email I receive is that it comes at approximately the same time in the morning. I look for it to arrive, and I also know when it comes in late. Therefore, timing is necessary, and you don’t want to set up expectations then not be able to deliver. Your email subscribers are counting on that email to be on a regular schedule. Your deliverability matters, if you become blacklisted or get blocked by ESPs, the engaged users can become unengaged quickly. Become empathetic with your email subscribers. Your message must be conveyed in a way the customer can understand. Craft your words around identifying common pain points your customer’s experience. Help them by solving some of their problems through sharing your knowledge and experience. Education is a powerful way to use empathy to gain more loyalty from your audience. Often email subject lines such as “We need your help to improve.” Is also a great way to connect with your clients on a more one on one level. Send them a survey tell them you need their feedback to improve the shopping experience. This way the customer feels like you are valuing their feedback. Don’t send them the boring 1 through 10 do you strongly agree or disagree survey but create something that is more unique. You must always value your customers time as well, so if you are requesting something from them, please keep it brief. Otherwise, you will get a lot of unfinished results.